A Bull Bar is far more than just a simple protection device for you and your vehicle, it is a purpose built 4WD accessory designed for strength, functionality and stylish good looks for the modern vehicle. It provides the mounting place for lights, winches and aerials that will withstand animal strikes, impacts with terrain and other vehicles - that would otherwise cause more expensive damage and the inconvenience and disappointment of a ruined holiday. In particular the light weight design improves your vehicles ground clearance, approach angle and turning circle. There is no compromise in your vehicle's handling and performance. Each bar is designed and manufactured to suit the model of vehicle and compliment the original lines and body shape. All steel bars are finished in a high quality long lasting powdercoat. 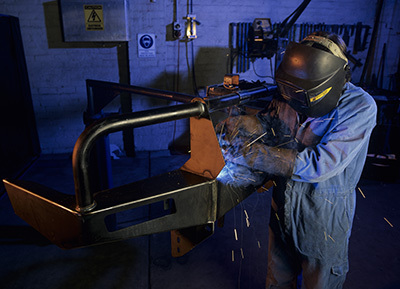 The computer aided design is the key to all the characteristic benefits of both the Steel & Alloy bar - safety, good looks, strength, light weight, impact resistance, ground clearance and vehicle protection. The one piece folded & welded bumper design provides light weight structural strength and rigidity, the multiple axis chassis mounting system gives the bar its strength by mounting it to the chassis in all three directions and spreading the load. This type of engineering means reduced weight while maintaining the strength of the old style steel bars of a bygone era. The mounting system is much stronger than the single 'flat plat' mounts common to low quality steel and most alloy bars. The tapered wing and angled bumper sections improve ground clearance, approach angle and turning circles resulting in improved off-road performance as well as having the benefit of an attractive slimline design which further reduces weight.